As a university student studying biology and ecology, we use to call the cellular and genetic biology students “cell squashers” to reflect the tendency to squish Drosophila melanogaster salivary gland cells for genetic studies. It was all in good fun of course, since in truth what biologist isn’t, in his or her heart of hearts, not fundamentally interested in genetics? As I have mentioned earlier, the grape variety Pinot Gris is know in Hungary as Szürkebarát or “gray monk”, and that the Pinot variety is know to be genetically unstable. Pinot Noir, Pinot Gris and Pinot Blanc are all variations of Pinot caused by slight genetic mutations. From time to time I have seen a few berries of Pinot Gris fail to change to the expected color on a cluster. And Pinot vine can even have different canes vary in the color of their clusters. 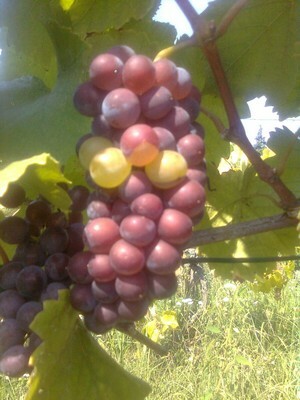 So some variation between clusters and berries is known and expected. But this year I was very interested to see the process occur on single berries. That is, half or 2/3rds of a berry was one color and the rest was another color. Genetic recombination at work creating a Pinot Gris berry mosaic. Incomplete color change in Pino Gris berries. 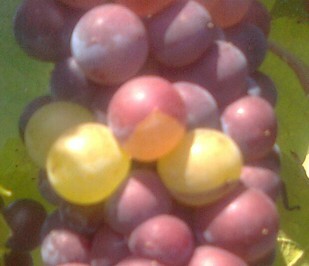 Close up image of incomplete color change in Pino Gris berries. In one cluster: one berry (lower right) was left half colored, one berry (middle) was only 2/3rds colored and two berries failed to change at all.